The NYPD's secretive Lower Manhattan Security Coordination Center uses software from IBM in its video analytics system, which allows cops to automatically scan surveillance footage for machine-generated labels that identify clothing and other identifying classifiers. Recently leaked corporate documents from IBM provide the first real insight into how this system was developed and used. 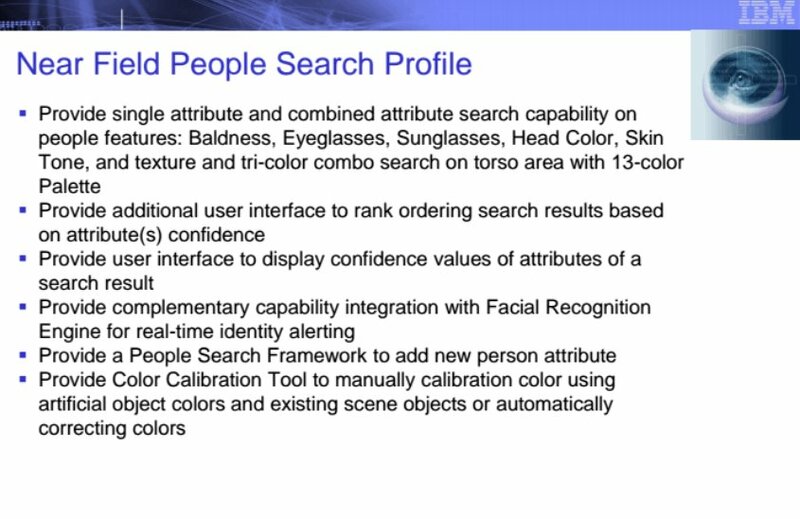 Since at least 2012 and until at least 2016, IBM's video classification tool has allowed NYPD officers and contractors to use skin color as a classifier for identifying suspects; the training data for this feature came from the NYPD's own footage. Police officers were reportedly told not to use skin color as a search term. More recent versions of IBM's tools have "ethnicity" search boxes that allow users to search on terms like "white," "black" and "Asian." The NYPD is notorious for decades' worth of mass-scale racial profiling scandals, ranging from stop-and-frisk to public executions of black people. IBM was a key collaborator in the Nazis' campaign of genocide, providing the technological tools that made racial profiling and mass extermination possible.